The indigenous tribes of Costa Rica left little evidence of their culture behind. The only larger settlement that is more or less preserved is in Guayabo. The other main artifacts that are approximately 500 stone spheres, which were found on the Southern Pacific side of Costa Rica, by the rivers Sierpe and Térraba, close to Palmar). Some of these spheres weigh up to 15 tons and it’s unknown how these stones were produced or transported, and what they were meant for. Most of the spheres are made of pluton (magmatic rock) such as Gabbro or Granodiorite. The exact purpose of the stones remains unclear, since the original inhabitants of Costa Rica left no written reports behind, and their cultures are by now mostly extinct. 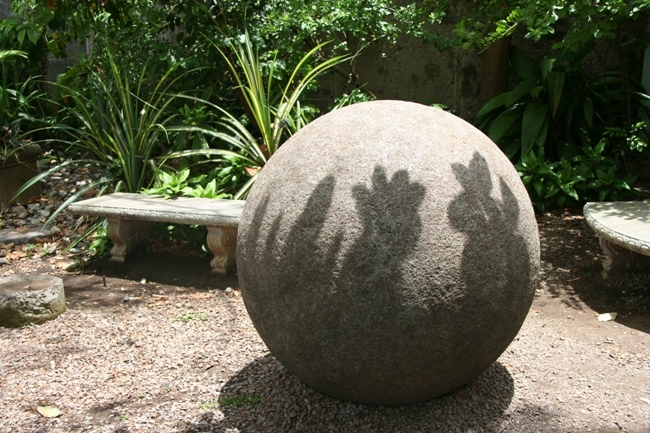 It seems most likely that the stones were used as astronomic gardens to measure growth cycles. Another possibility is that the order of the spheres represented the social order within and among the various tribes. A further (secondary) assignment might have been that the spheres constituted as meeting points for the tribe chiefs. The largest mystery remains the transportation of the stones, since there are no stone pits in the near proximity. There are some popular theories, claiming that the stones were transported with the aid of extraterrestrial aliens (as with all theories by Erich von Däniken and Juan José Benitez, there is no scientific proof for any of those claims). Vast archaeological research will be necessary in order to find plausible explanations.